Provide comfort for the family of Richard Doyle Duncan with a meaningful gesture of sympathy. Richard Doyle Duncan, 85, of Andrews passed away on Wednesday, January 23, 2019 in Andrews. Family and friends will gather to celebrate his life at 1:00 PM Saturday, February 9, 2019 in the Payne Gap Cemetery. The family will receive friends after the service at the home of Mike Hunt, FM 572-E, in Goldthwaite. Cremation arrangements are under the personal care of McNett Funeral Home in Andrews. Please celebrate his life by visiting www.mcnettfuneralhome.com. Doyle was born on November 25, 1933, in Mills County (Payne Gap), Texas, to Thomas Ell and Jessie Hunt Duncan. He was a loving son, husband, father, grandfather and great-grandfather. He was baptized at an early age and a member of Moline Baptist Church. He attended schools in Payne Gap, Star and Goldthwaite, Texas. On December 22, 1951, Doyle married Norma Kathryn Hammond in Goldthwaite at First Baptist Church. Three children were born to this union, Vaneta Kay, Richard Alan, and Jana Rae. They lived and worked in Midland, Texas, until 1966, when they returned to Goldthwaite where Doyle was engaged in farming and ranching and owned and operated a liquid feed and fertilizer company. 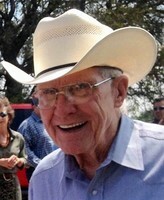 In 1978, Doyle and Norma moved to Andrews, Texas, where he worked for Farmer Construction Company (J.R. Brinson and Jerry Hammond). In 1981, Doyle formed his own company, Duncan Construction, building roads and drilling locations in the oilfield. Doyle was a very honest and hard-working man and made many friends in all his ventures. Doyle is survived by his wife of 67 years, Norma, his three children, Kay Hourihan and Don Ingram of Andrews, Richard Duncan of Goldthwaite, and Jana Peters and husband Pete of Andrews; grandchildren, Hallie Martinez and husband Eric, Bonnie Nunez and husband Aron, Gilbert Peters and wife Barbara, and Tammy Peters all of Andrews; great-grandchildren, Seth, Olivia and Julia Martinez, Emma, Aiden and Mila Nunez, Heather Alberts, Nichole Cochran, Jordan Peters, and Cody and Brandon McCane, as well as numerous cousins, nieces and nephews. He is preceded by his parents, one brother, Troy Duncan, two sisters, Opal Prachyl and Dorothy Elliott, grandson Jeremy Ray Peters, and son-in-law, Michael E. Hourihan. In lieu of floral arrangements, contributions may be made to Payne Gap Cemetery, c/o Mike Hunt, FM 572-E, Goldthwaite, Texas, 76844, or to Mills County Veterans Memorial, PO Box 11, Goldthwaite, Texas, 76844. To send flowers in memory of Richard Doyle Duncan, please visit our Heartfelt Sympathies Store. The family will receive friends after the service at the home of Mike Hunt, FM 572-E, in Goldthwaite. We encourage you to share your most beloved memories of Richard Doyle Duncan here, so that the family and other loved ones can always see it. You can upload cherished photographs, or share your favorite stories, and can even comment on those shared by others. Provide comfort for the family of Richard Doyle Duncan by sending flowers. Gwynn and I just wanted to express our sorrow at this time. Don't believe I ever had the pleasure of meeting your father, but know we have a lot of respect for his son. He was born in the same month I was, so know he felt he'd had a pretty full life for you and your family to celebrate. He was a great person, and he will be missed. God bless his family. RIP dear friend.